Today’s recipe is for rich, buttery, scones sweetened with maple syrup and loaded with pecans, dried fruit and chocolate chips. Well, actually just chocolate chips since I left out the dried fruit, but add-ins are always subjective. The maple scones recipe is from a new cookbook called Modern Maple, written by Teresa Marrone and published by The Minnesota Historical Society Press. 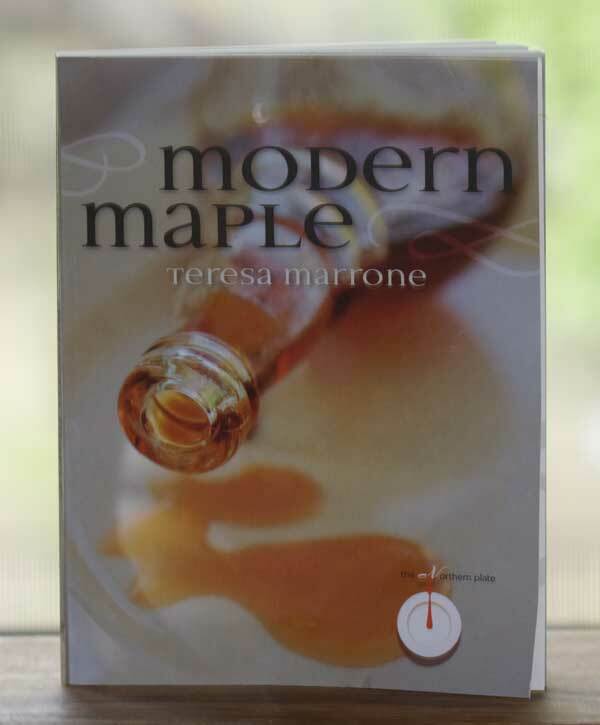 A book that I am very happy to have in my collection and will use for years to come, Modern Maple talks about the tree itself, gives a brief look at the history of maple syrup making, and features dozens of recipes from savory to sweet. I tried the scone recipe first, but I’ve bookmarked tons of others including Pan Roasted Cauliflower with Maple, Roasted Carrot–Ginger Soup with Maple, and an incredible sounding Maple Baklava. I can’t wait to try all the recipes on this list. 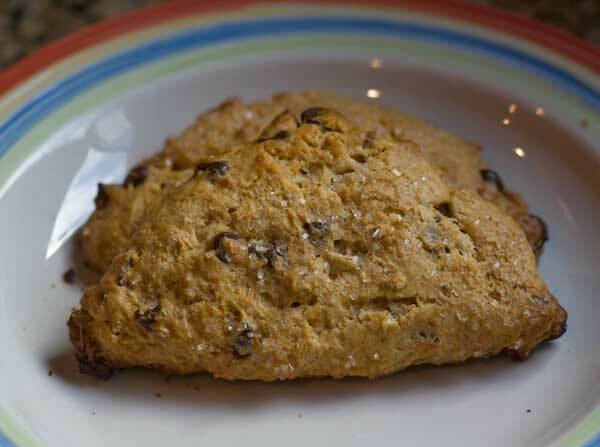 For now, here’s the scones recipe reprinted with permission from Modern Maple. Because my number one scone fan doesn’t care for dried fruit, I used dark chocolate chips in place of the cranberries. I also quartered the recipe, shaped the scone dough in a square, then cut it to make two large triangles. She had one for breakfast this morning, and we froze the second. Speaking of which, most scones freeze well, but you can also freeze the dough. I made a small batch of the recipe, but if you plan on eating scones more often, you might make the full recipe, freeze the triangles of dough individually, then bake them fresh on the mornings (or whenever!) that you want fresh scones. "Over the years I’ve tried many methods to produce light, tender scones, including using cornstarch, rice flour, or potato flour to replace some of the all-purpose flour. A recipe from Fine Cooking magazine finally convinced me that a mix of all-purpose flour and cake flour is the way to go; the generous amount of butter doesn’t hurt, either. For the best texture, handle the dough as little as possible and pat it out by hand rather than using a rolling pin. Makes 8 scones." Position oven rack in the center of the oven; heat to 375 degrees. Line a baking sheet with parchment; set aside. Combine all-purpose flour, cake flour, baking powder, and baking soda in food processor; pulse a few times to mix. Add butter; pulse until the mixture resembles coarse sand with a few pea-size lumps, about 10 pulses. Transfer to a mixing bowl. (Alternatively, sift together the all-purpose flour, cake flour, baking powder, and baking soda into a mixing bowl, then cut the butter into the flour mixture with a pastry blender until the mixture resembles coarse sand with a few pea-size lumps.) Stir in the cranberries and pecans. In measuring cup, stir together the buttermilk,syrup, and vanilla. Add to the flour mixture and stir with a wooden spoon just until everything is moistened; the dough will be sticky. Turn the dough out onto a lightly floured work surface and pat into a circle just under 1 inch thick; pat the edges with your hands until they are even and smooth, then cut into 8 wedges. Use a spatula to transfer the wedges individually to the prepared baking sheet, spacing them several inches apart. Sprinkle the sugar over the wedges. Bake for about 20 minutes or until firm to the touch and lightly golden on the edges and bottoms. Transfer to a rack to cool for at least 20 minutes before serving; serve warm or at room temperature. Reprinted with permission from Modern Maple by Teresa Marrone published by Minnesota Historical Society Press. I went to a maple syrup demo at the Minnesota Landscape Arboretum two weekends ago. It was Maple Syrup days, but not much sap was being collected because of our long Winter/late Spring. I learned it takes about 30 gallons of sap to make a gallon of syrup!!! I will try these soon since I always have maple syrup around. We use it as a topping on vanilla ice cream. I think chocolate chips would be better for me too-I like maple and chocolate together. I’ll bet white chocolate would go well too.